﻿ Comfort Inn & Suites San Francisco Airport North, San Francisco (CA) | FROM $122 - SAVE ON AGODA! "Room was nice, clean and breakfast was great!" 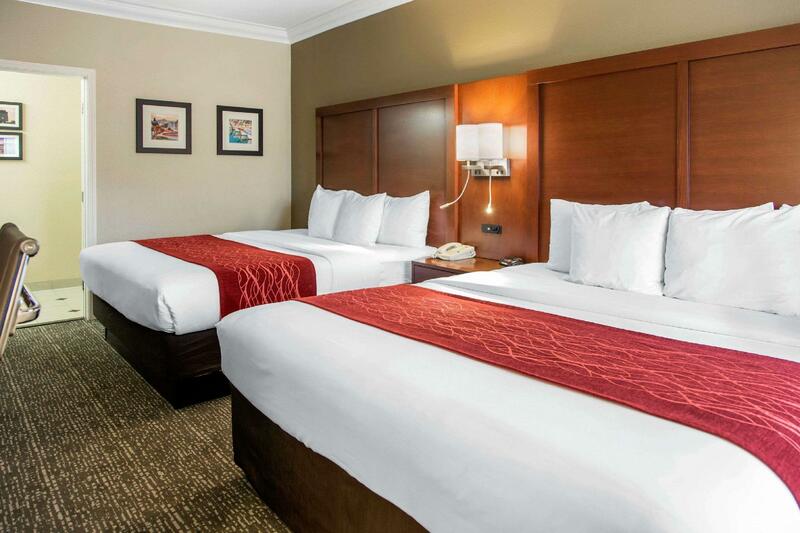 Have a question for Comfort Inn & Suites San Francisco Airport North? "Stay for my flight, the staff was very helpful, we ask late check out, they give half price, clean hotel,"
"Easy to find, big bed, good breakfast." "Clean, large room, good free buffet style breakfast, and free shuttle service to SFO airport." "Very good value of money in SFO area." 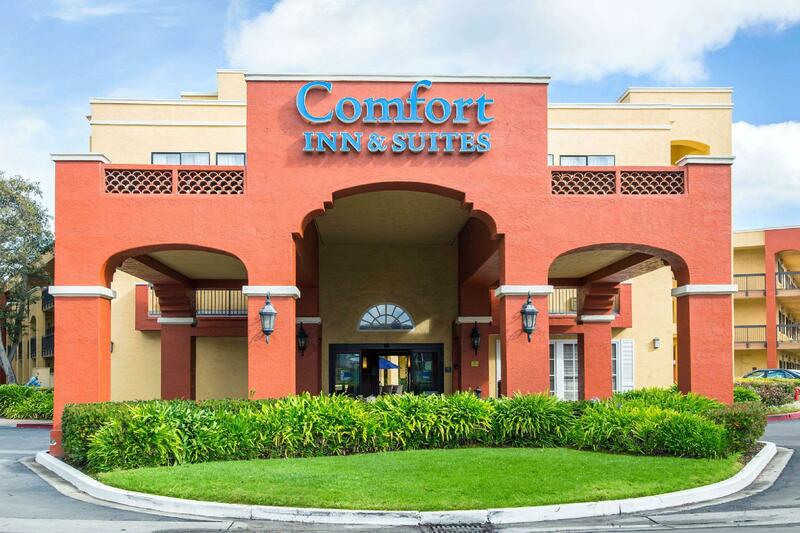 The Comfort Inn & Suites San Francisco Airport North is conveniently located off Highway 101, just three miles from the San Francisco International Airport. 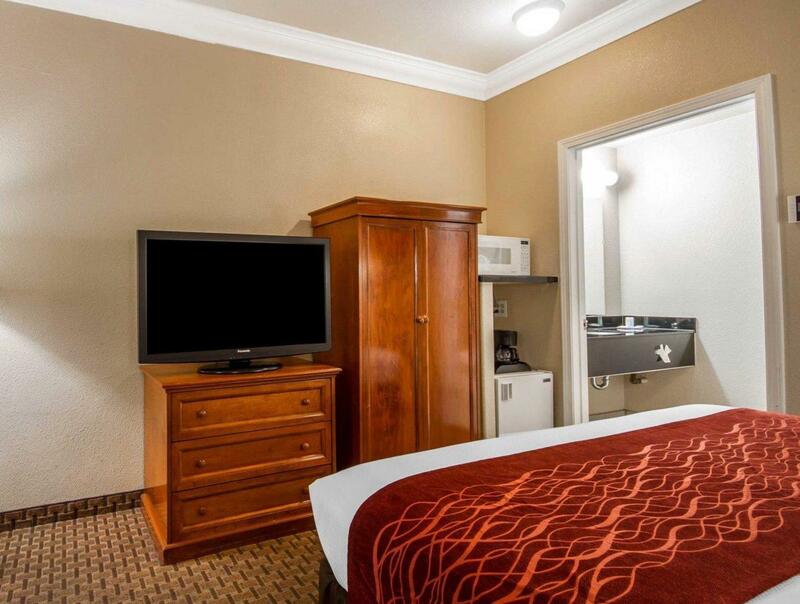 This South San Francisco, CA hotel is minutes from attractions like Monster Park, Cow Palace, Fisherman's Wharf, PIER 39 and the Golden Gate Bridge. Downtown San Francisco, Sausalito, The Moscone Center, the South San Francisco Conference Center and the San Mateo County Event Center are also close to the hotel. A variety of restaurants is located in the surrounding area. This South San Francisco, CA hotel is pleased to offer the following amenities: free airport transportation, free 24-hour coffee and tea in the lobby and free wireless high-speed Internet access in all rooms. Enjoy our free hot breakfast featuring eggs, meat, yogurt, fresh fruit, cereal and more, including your choice of hot waffle flavors! Guests can also enjoy the on-site fitness room or relaxing outdoor hot tub and garden courtyard area. Business travelers can appreciate the business center and access to fax and copy services. All deluxe standard rooms feature one king bed with one queen sized sofa sleeper, refrigerators, microwaves, coffee makers, irons, ironing boards, hair dryers and cable television with Showtime, Cartoon Network, Nickelodeon and on-demand movies. Be sure to ask about the hotel's stay and fly packages. Local restaurant menus with free delivery to the hotel are available at the front desk. An on-site coin-operated laundry facility and valet services are also available. "The room is very clean and big size." You must show a valid photo ID and credit card upon check-in. Parking Fee: 6.48 USD per day, length of stay only. Limit: One car per room, no bus or trailer allowed. Additional parking may be available for 37.80 USD per car, per day only if available. Credit Card holder must be legal age, with valid government photo ID and matching credit card to check-in. Reservations name and raised-imprinted credit card name must match. Credit card will be validated 72 hours prior to arrival for funds and name accuracy. Hotel does not accept cash payment or prepaid cards. Guests are required to show a photo identification and credit card upon check-in. Please note that all Special Requests are subject to availability and additional charges may apply. A clean, nice hotel with basic breakfast provided. Spacious room, close to airport, Only dowside is quite a distance away to downtown ( 30 min drive). Thank you for taking the time to complete our online survey regarding your recent stay at our hotel. Your feedback is very important to us. I apologize if you are taken aback with the rate. The hotel rate is based on the market surrounding us. We hope to see you again soon! Good size room and bathroom, breakfast selection limited, location is not great and parking fee is a fort. Thank you for your feedback regarding your stay with us. All of your feedback helps us create a better experience for our guests. We sincerely apologize for not meeting your expectation on the breakfast selection and the parking fee while staying with us. We hope you give us another chance to better serve you in the future. Thank you for taking the time to complete our online survey regarding your recent stay at our hotel. Your feedback is very important to us. I apologize with any unpleasant experience regarding the train noise and if you taken aback with the price. The hotel rate is based on the market surrounding us. We hope to see you again soon! Easy access to the Caltrain Station. Restaurants are within 5-7min walk. Clean, large room, good free buffet style breakfast, and free shuttle service to SFO airport. Very much a standard American motel, not a luxury hotel, but reasonably priced and comfortable. There is a railroad right at the back of the motel, but we weren’t bothered at all (maybe because we were in jet-lagged slumber or the soundproofing was really effective, who knows!). We arrived around 7:00 p.m. after traveling for over 18 hours from Germany. There were 4 others checking in ahead of us and only one man checking us in, and it took an HOUR before he got to us. We were traveling with our adult son and were told we had a room with only one king sized bed. I showed him my confirmation email showing I had reserved a room with 2 king beds, so he gave us keys to another room. We hauled all our luggage across the complex only to find that someone else was already in that room. We went back and he tried arguing with me that the room was empty. Then he told us that he only had a room with 1 king bed and a sofa bed, so we took that. We dropped off our luggage and went to get something to eat. When we came back, we noticed the woman who had checked in right after us opening our door. We told her it was our room and she insisted it was hers. When she saw all our luggage she left. The rooms were nice, but I would never go back based on our check-in experience! the airport shuttle is very frequent at around 20-30 minutes. Good location is you are just looking for a place to stay before your flight. Pretty much in the average business hotel of its class. Cant complain about anything, cant say anything extraordinaire about it. Breakfast is literally the same as anywhere else e.g., My choice was based on location and cleaniness, which has been fulfilled. Excellent service, breakfast and location. I enjoyed the stay for the overnight. The room was nice and comfortable. The staff was extremely friendly and engaging. i like the breakfast here. the room is very clean and big size. bathroom is also big. Room was nice, clean and breakfast was great! We stayed overnight having arrived late from the airport. Conveniently located motel. Staff are friendly and helpful. Breakfast is serve yourself buffet. Food good. Room was fine, only disappointment was the TV--we could not get the Giants game. It costs reasonable for the area as San Francisco. The room is old but clean and neat. Simple breakfast id included.